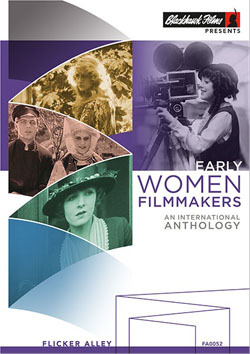 Flicker Alley and Blackhawk Films® are proud to present Early Women Filmmakers: An International Anthology, a landmark Bluray/DVD collection of newly restored films by early cinema’s groundbreaking women directors. This extensive set of 25 films from 14 international directors showcases the innovative technical and stylistic contributions of women, a vital missing piece in the canon of cinematic history. More women worked in film during its first two decades than at any time since. Unfortunately, many early women filmmakers have been largely written out of film history, their contributions undervalued. This necessary and timely collection highlights the work of 14 of early cinema’s most innovative and influential women directors, rewriting and celebrating their rightful place in film history. International in scope, this groundbreaking collection features over 10 hours of material, comprised of 25 films spanning 1902-1943, including many rare titles not widely available until now, from shorts to feature films, live action to animation, commercial narratives to experimental works. Directors include Alice Guy Blaché, Lois Weber, Mabel Normand, Madeline Brandeis, Germaine Dulac, Olga Preobrazhenskaia, MarieLouise Iribe, Lotte Reiniger, Claire Parker, Mrs. Wallace Reid (Dorothy Davenport), Leni Riefenstahl, Mary Ellen Bute, Dorothy Arzner, and Maya Deren. This anthology is dedicated to the memory of David Shepard (1940-2017), without whom these films –along with countless others – would simply not have been made available in such beautifully restored editions. The collection represents one of David’s final produced works, completed in collaboration with several film archives, including the French National Center for Cinematography and the Moving Image (CNC), the Film Studies Center at the University of Chicago, and the Library of Congress. Booklet Essay: By film historian and Women Film Pioneers Project Manager Kate Saccone. Audio Commentary: For Lois Weber’s The Blot by author, professor, and expert on women and early film culture Shelley Stamp, courtesy of Milestone Film and Video.